The San Bernardino Mountains are a high and rugged mountain range in Southern California in the United States. 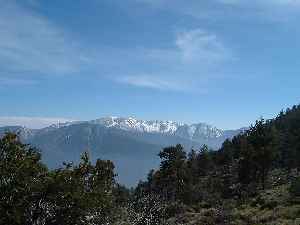 Situated north and northeast of San Bernardino and spanning two California counties, the range tops out at 11,489 feet (3,502 m) at San Gorgonio Mountain – the tallest peak in all of Southern California. The San Bernardinos form a significant region of wilderness and are popular for hiking and skiing.